Obama's Fourth Year Commutation Blitz. How Historic? 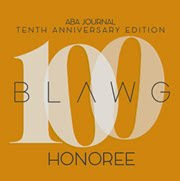 While it is true that most presidential terms have featured the highest number of individual clemency grants in the fourth and final year, Bill Clinton's last-minute fiasco was an extremely rare bird. 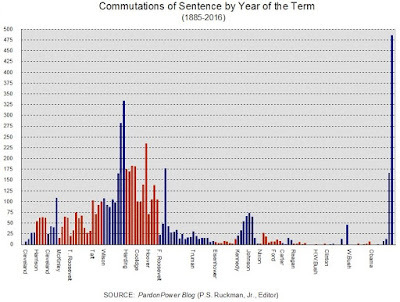 For most presidents, commutations of sentence have been but a tool in an arsenal of clemency options (including pardons, conditional pardons, group pardons - or amnesties - respites and reprieves, remissions of fines and forfeiture, etc.). But, for President Obama, they are damn near everything. Indeed, 91 percent of his clemency grants have been commutations of sentence. Previous to 1885, the distinction between pardons and commutations of sentence was more vague, but it is safe to say that Woodrow Wilson was setting records as his administration progressed. At first glance, one might guess Obama has set the all-time record for commutations of sentence, but that would be false. Both Woodrow Wilson and Calvin Coolidge granted more. They just didn't wait until the very end of their terms to dump a big load of them. Mercy was a regular (monthly) feature of their administrations, not so much an afterthought, or last-minute stunt. 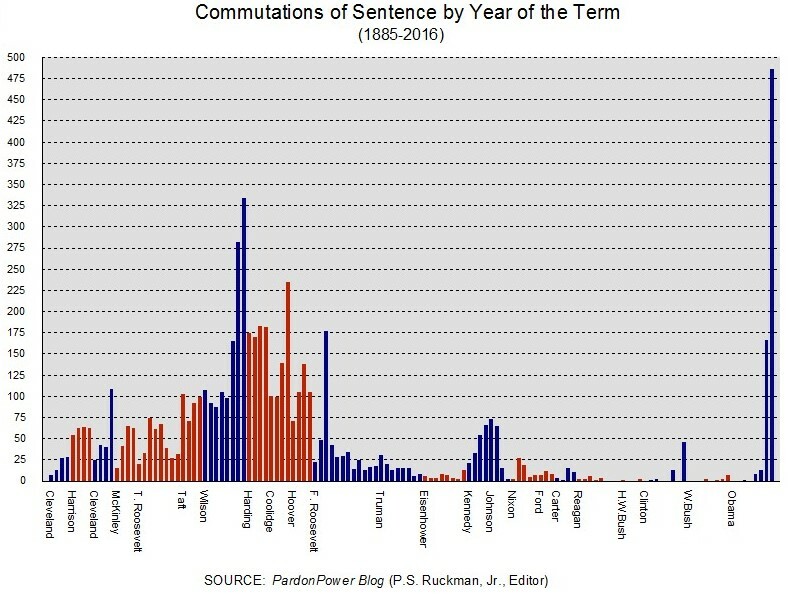 It is safe to say that the President has set a record for the most commutations of sentence granted in a single year - the fourth year of his second term which, of course, is not yet over. As we recently revealed from our own, original data, he has also set a new record for most commutations of sentence granted in a single day. Thanks for this post and your excellent blog in general. How does Obama stand if the metric is clemency granted as % of total federal incarcerated population?